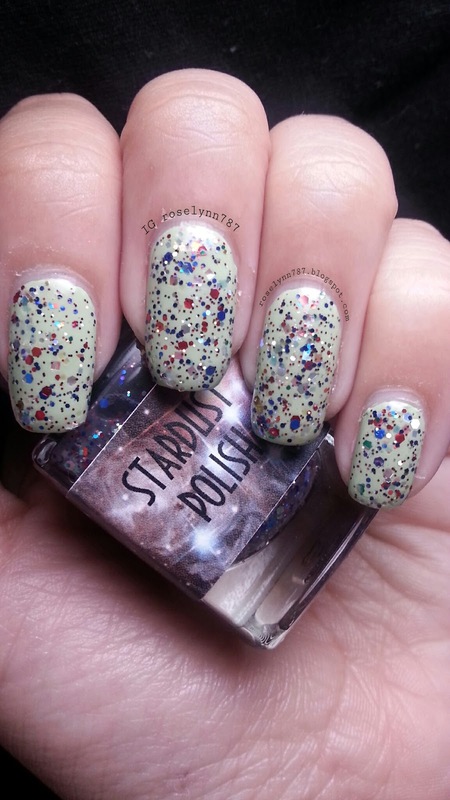 Today I'll be reviewing the Alice in Wonderland collection by Stardust Polish. I've had this collection sitting for a while, since I was able to grab it on release, and finally found the time to give these beauties the time they deserved. 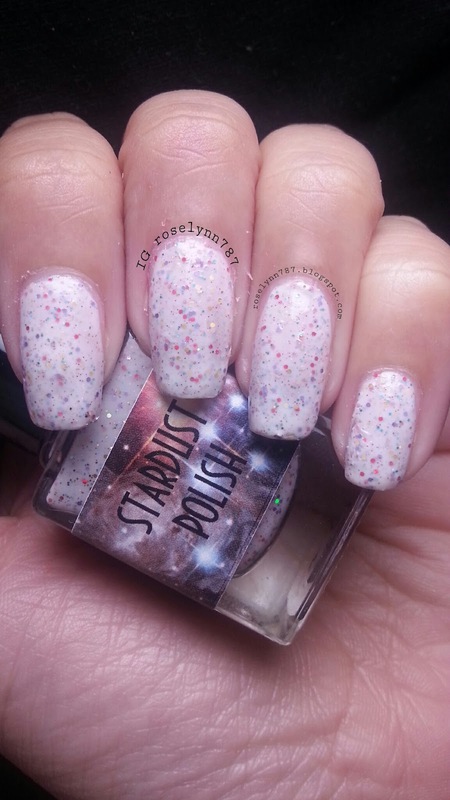 First up is Very Merry Unbirthday, a clear glitter topper that looks great over any color. I chose to lay this one over Sinful Colors' Colors of Summer. 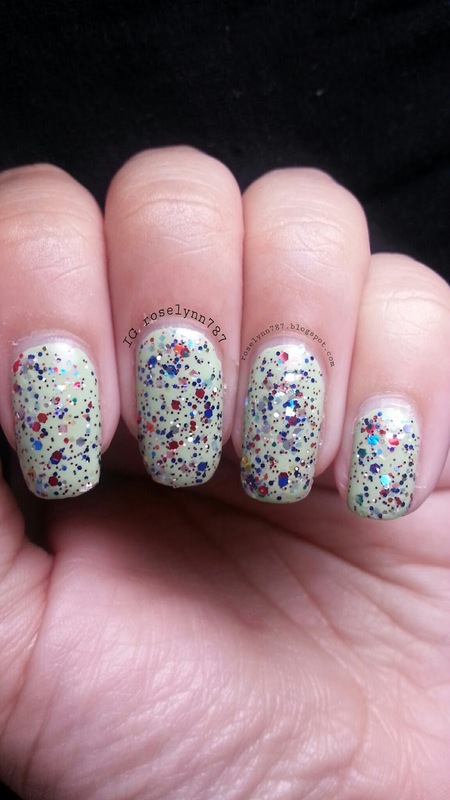 This polish is filled with glitters of various color and size. Every brush stroke has plenty of glitter, and in just 2 coats I managed to cover mostly all of my nail. No glitter fishing here ladies! I'm pleasantly surprised that I found no gloppiness in the application as I do with most glitter toppers. I'd definitely recommend this one for any glitter lover. 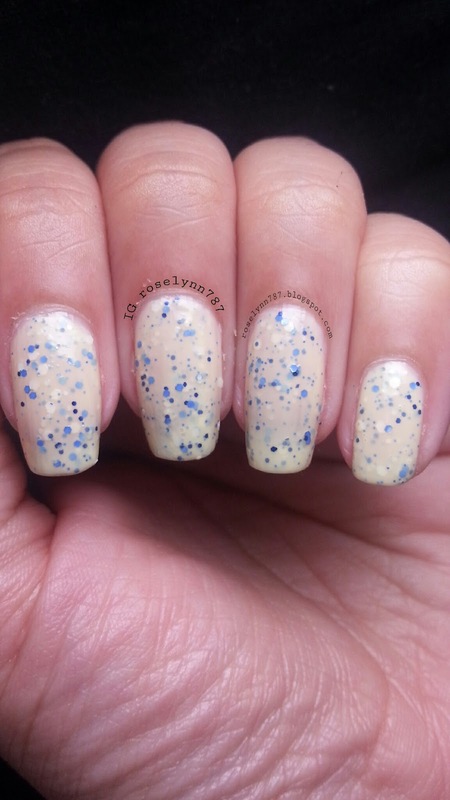 Next up Miss Alice, a beautiful pastel yellow crelly filled with light blue, blue, and white glitters. I used 3 coats with no undies for my swatch of Miss Alice. It is sheer in one coat; for complete opacity you'll have to use 2-3 thin coats. Personally, two did not achieve complete opacity, so a third one was needed. 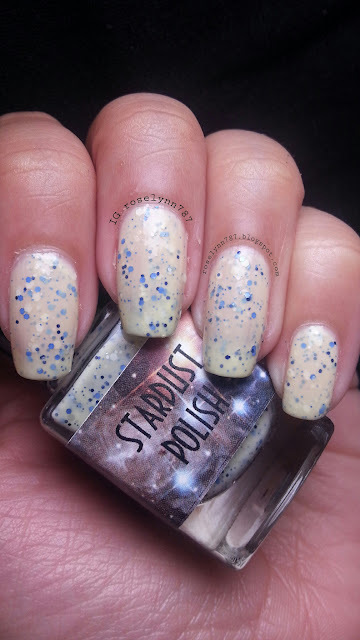 As a fan of Stardust Polish, I'm not surprised by the smooth application, but if you don't have one of her polishes in your collection, then you're definitely missing out. I love the contrast of the two blue glitters against the yellow, while the white glitters just makes it all blend nicely. This polish is perfect no matter the season! Next up we have Mr. Rabbit, a white crelly filled with red, purple, light blue, and sparky gold glitters. All I can think about is that Rabbit going, "I'm late, I'm late, for a very important date!" when I look at this polish. The gold glitters are a perfect touch to make this polish 'pop'. As soon as I saw the sparkle in the bottle, it got me thinking of that little rabbit in his jacket holding his pocketwatch. 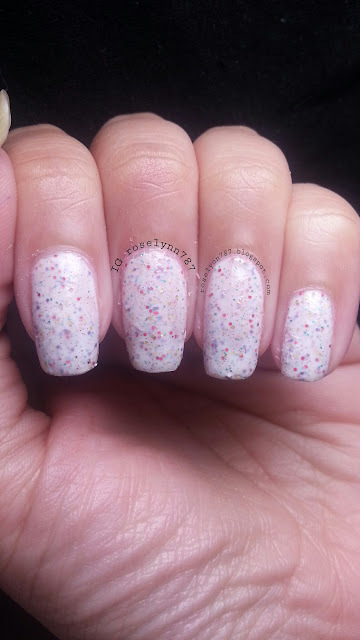 Mr. Rabbit is sheer in one coat; I used three coats for complete opacity. No topcoat was added in the picture just so you guys can get a feel for it. I do recommend a topcoat, however, glitter polishes look significantly better with a nice thick topcoat. 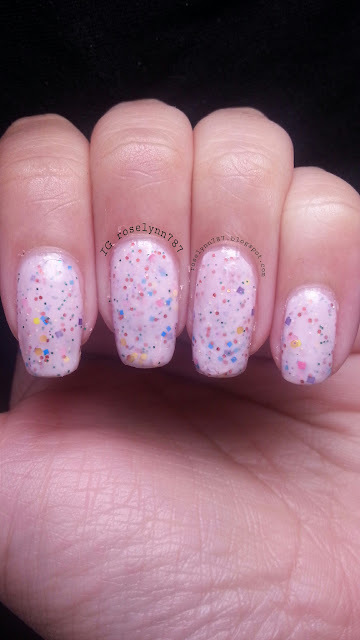 Next we have Flowers Can't Talk, a light pink crelly filled with different colored and sized glitters. Flowers Can't Talk has glitters of different sizes and colors: pink, marigold, blue, purple, and yellow. The variety of glitters makes for a nice mixture that reminds me of a flower garden, of course! Smooth application and no fishing for glitter, just like the previous two. Not much else to say about this as it is very similar to the previous two. But this beauty will definitely be showing up in the future as a great base for nailart! Next up we have Yes Your Majesty, a cherry red holo polish. Holo lovers please gather around as a goddess has been born. 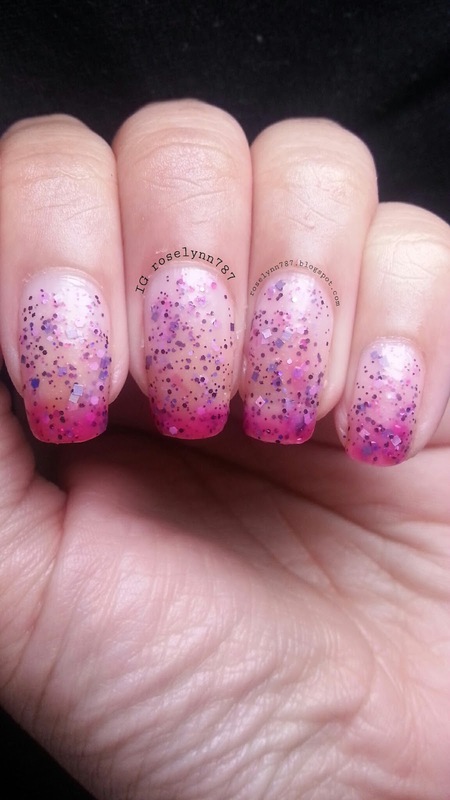 Drema makes us all see why she is the queen of holo polishes right here! 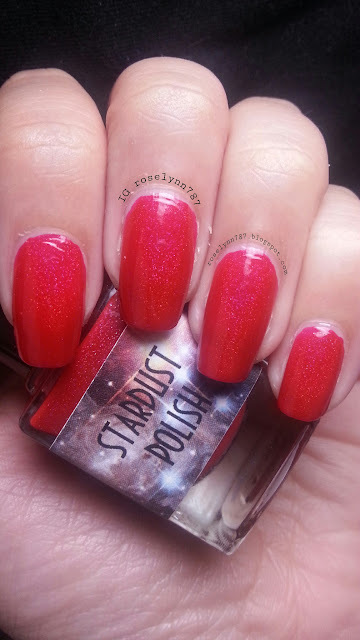 Yes Your Majesty is a spectacular cherry red holo that will take your breath away without a doubt. Full opacity can be achieved in 2 thin coats, one coat is sheer. I recommend this one, 10/10 stars, it is perfection bottled up. This is a color that looks great going casual or having to get dolled up. A definite must have and my favorite in the whole collection. 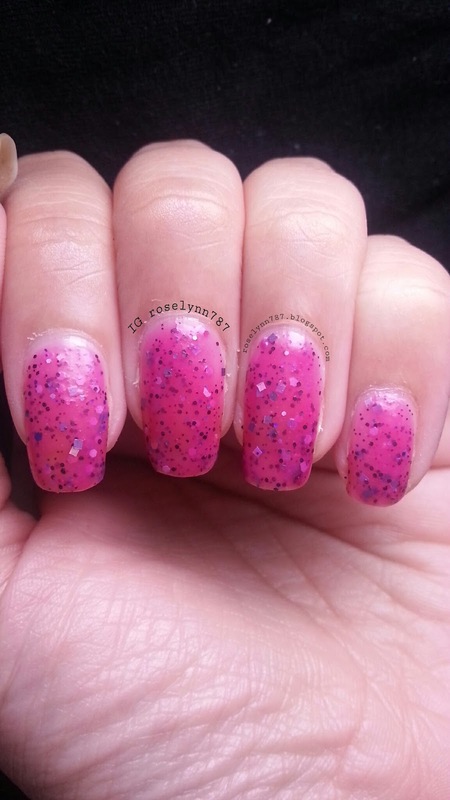 Simply Mad, is a jelly thermal polish going from fushia to clear based! Why I'd have to be 'simply mad' not to be in love with Simply Mad! Hehe. Okay I'll stop with the bad puns. But this polish is a gem, no jokes about it. I decided to not use an undie for this swatch, though it is recommended that you do, for better opacity and thermal effect. It is a very sheer polish so without a base, it took about 3-4 coats for it to be 85% opaque. As a thermal polish this changes based on coldness or warmth. When cold you'll have a fushia color, and then when warm you'll have it clear based, like in the second picture. I'm a sucker for thermal and this one is really a cute one indeed. I just love the look that it gets when it's warm except for my nail tips (second picture). I definitely recommend this one, my second favorite of the collection. Overall I'm very satisfied and happy I was able to purchase these beauties. 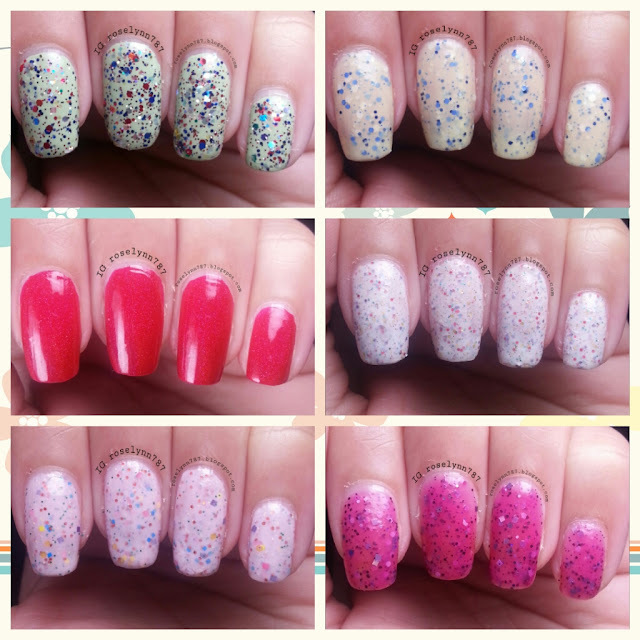 The variety in color in the polishes were perfectly mixed and very reminiscent of Alice in Wonderland. As I stated before, if I have to pick a favorite it'd have to be Yes Your Majesty with Simply Mad as a close second. The application to each and very polish is very smooth: no clumps, bald spots, or streaking. Good dry time for each one, even with the amount of coats I had to use to achieve opacity. 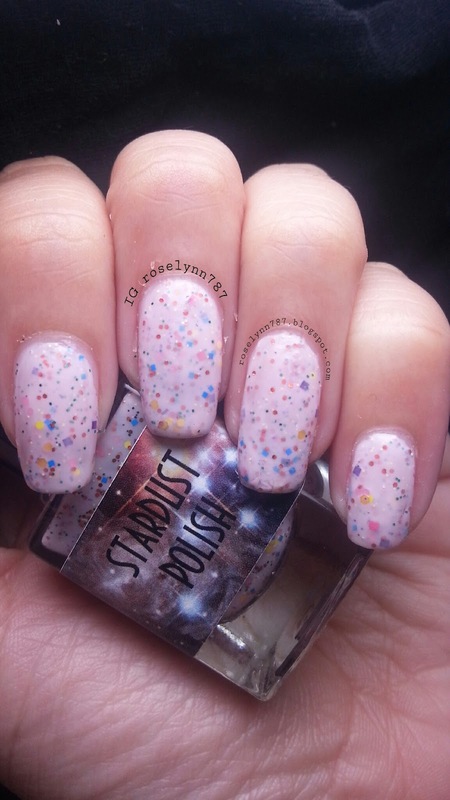 Check out Stardust Polish for polish availability and restock dates.